Last week, I wrote about how I sewed two dolls this past year. That was not my only sewing project. 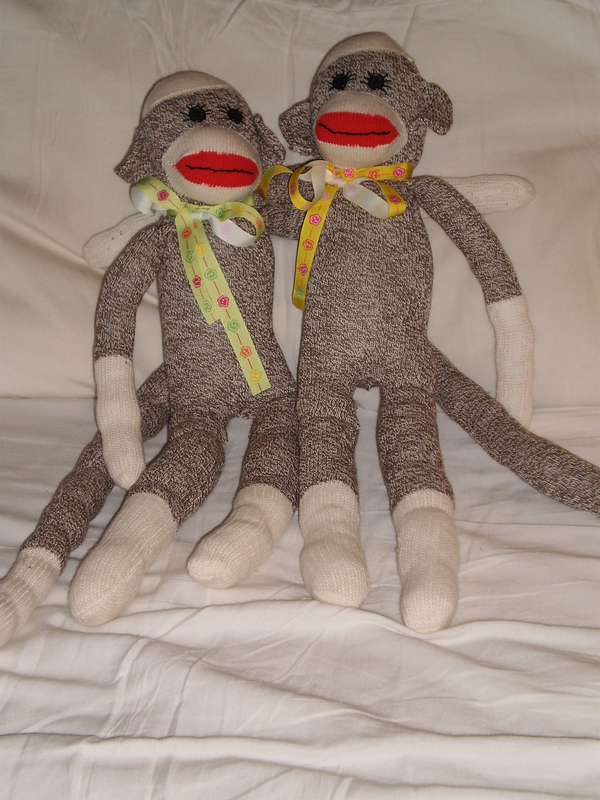 I also sewed two sock monkeys for my daughters after I found a kit at the draft store. The kit was particularly handy, since the type of socks traditionally used for sock monkeys are no longer produced. I’ve always wanted to sew a sock monkey, since it seems to be one of those projects that “real” sewers undertake. And sock monkeys are cool. Sewing sock monkeys was considerably simpler than sewing dolls, and I completed the sock monkeys almost entirely on a road trip to a family wedding. Here is a picture. This entry was posted on Monday, January 11th, 2010 at 10:50 am	and posted in Uncategorized. You can follow any responses to this entry through the RSS 2.0 feed.